Mike Lardy has been the owner and head trainer at Handjem Retrievers since 1981. In that time he has trained 101 Field Champions and his dogs have earned 22 National titles. Elected to the Retriever Hall of Fame in 2004, Mike holds the record for winning seven National retriever Championships. He has helped thousands of retriever enthusiasts from around the world with his Total Retriever video series, article collections, and workshops. 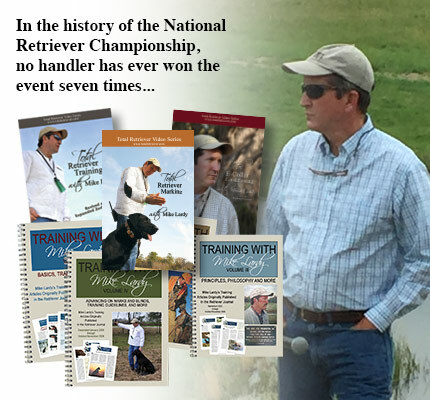 In addition to winning seven Nationals, Mike has handled 36 National finalists, and numerous Handjem trained dogs have been Finalists with their owner-handlers or with Mike’s assistants. Thirteen dogs, trained primarily at Handjem Retrievers, have been elected to the Retriever Field Trial Hall of Fame. Step-by-step DVDs and articles take you through training methods that Mike Lardy has used to produce consistent winners. Mike shows you how to train your retriever from basic through advanced training.